This recipe started out about mangoes. 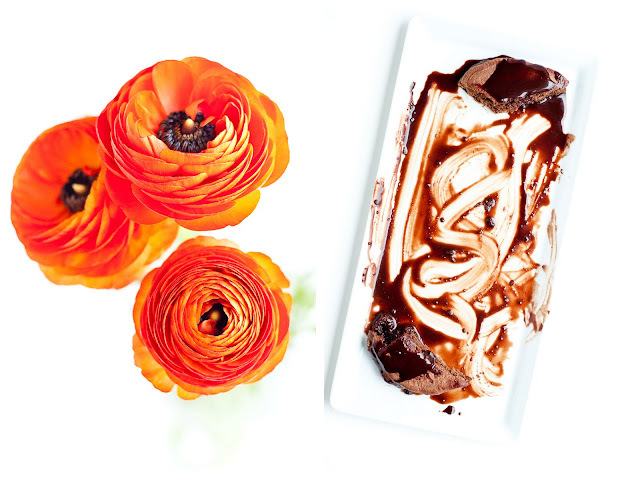 But, like many good things that happen in life, it ended up being all about chocolate. Sorry, mango. Allow me to elaborate. One day, as I was researching spring fruits and vegetables, I was shocked to discover that mangoes are a spring fruit, according to one Bon Appetit page, which I haven't bothered to go back and dig up (so don't take my word for this). It surprised me, because I'd never thought to associate mangoes with springtime, but it finally did explain to me the mysterious and sudden appearance of massive mango displays at the front of my local Whole Foods. Anyways, since it's been my goal and challenge to try out as many seasonal flavors in pancake form as possible, mangoes sounded quite promising. Especially so, because they immediately called out, "Pair me with chocolate pancakes!" (yes, I'm one of those people who anthropomorphizes a lot.) Chocolate pancakes! yes! I've been putting off chocolate pancakes since the beginning of this crazy pancake project I've been on, but suddenly, mangoes seemed the perfect companion with which to introduce chocolate pancakes. And then, this is where it stops being about mangoes and starts being all about chocolate. Here's an illustration. 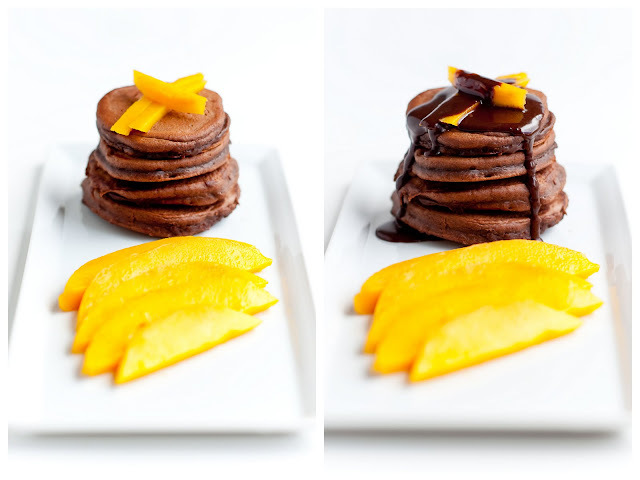 The photo below to the left is what my original vision had been, when I first hatched this idea: plain and simple chocolate pancakes with slices of mango. But was that enough for me? Ah, no. Let's double the chocolate. Let's add chocolate syrup. See picture above and to the right. Ah, yes. That's how it should be. 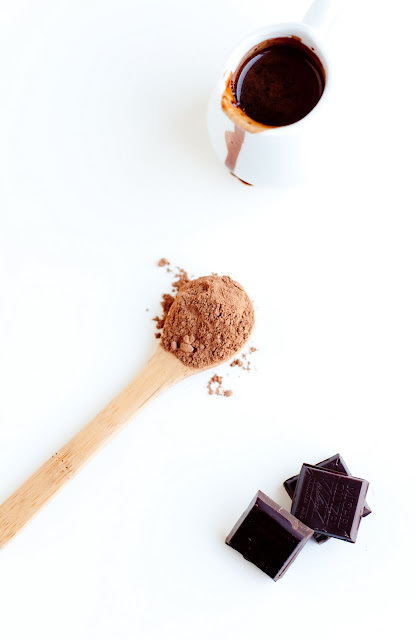 All about the chocolate. I've been putting off chocolate pancakes for a while now, mainly because they were intimidating. I didn't want to simply produce pancakes that were chocolate. If I made chocolate pancakes, I wanted them to be CHOCOLATE pancakes. Emphasis on the chocolate. And, with some trial and error, these are most definitely it. They're chocolate-ly, but not really sweet at all, and they taste like a cross between a dense, thick, and robust chocolate brownie, and a lighter chocolate cake. The generous amounts of chocolate sauce also make these pancakes. I don't think I would ever eat chocolate pancakes without chocolate sauce. The sauce and pancakes were made for each other. Poor little mangoes. 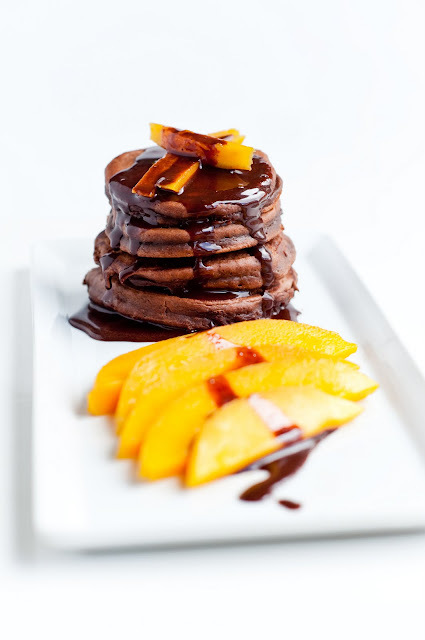 So side-lined by the chocolate, but I did very much appreciate having the mangoes, because they provided just enough sweetness and fruit to fill out the heavy, ever-so-slight bitterness of the cocoa in the pancakes. And, they most definitely helped to allay my worries about not eating healthily: see, Mom?, there's a serving of fruit amidst the chocolate! Unrelatedly and on a more personal note--since, this is, a blog after all, I finally finished this really big paper that I've been working on for my day job. It's been hanging over my head for quite a while now, but at last, it's done! The only things I have left to do are to orally defend the paper, and, provided that I pass the oral defense, make revisions and turn it in. This is especially exciting for me because it's the last major requirement that I have to complete before I finally get to work 100% of the time on my own research for the Dissertation. After three long years of jumping through hoops, fulfilling requirements, taking classes, writing papers, I am finally going to be able to do what I came to grad school to do! It's all very awesome. Ah, and celebrating with chocolate chocolate pancakes--and mango--wasn't too bad of a deal, either. Here's a question for you all: how do you plan on using mangoes this spring? 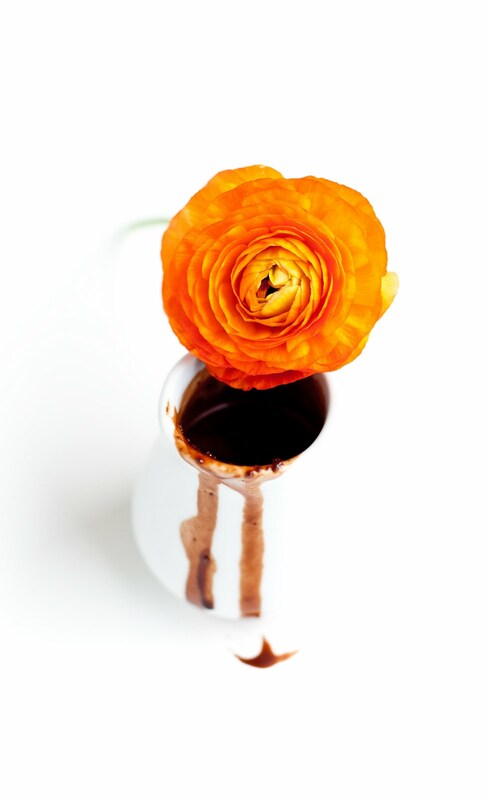 for the chocolate sauce, I used David Lebovitz's chocolate sauce recipe. It's a good recipe, but it turned out thinner than I would have preferred, possibly because I used agave nectar instead of corn syrup. If you're going to use agave nectar, consider going easy on the water. 1. Set aside 2 oz. of milk. 2. In a bowl, combine 6 oz. milk, eggs, and vanilla extract and whisk thoroughly. 3. Add the flour, cocoa powder, sugar, baking powder, and salt. Whisk to combine. 4. Put the remaining 2 oz. of milk and butter in a saucepan over medium-high heat. Bring just to a boil. 5. Whisk the heated milk and butter into the pancake batter just until smooth. Do not overmix! 6. Oil lightly a medium hot skillet and cook the pancakes. 7. 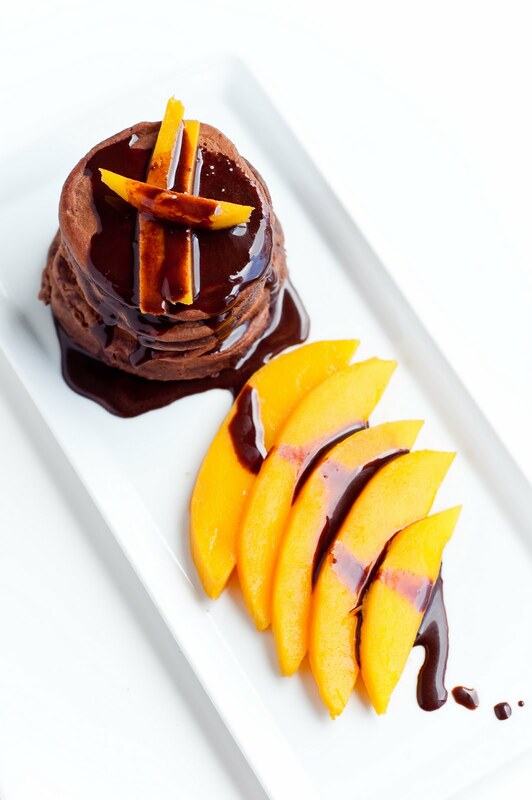 Serve with sliced mango and chocolate sauce. Those chocolate pancakes look amazing! I definitely want them for breakfast. Yay! I have to admit I love your pancake posts the most of all. @Iris: I'm glad you like the pancake posts! :-) Yeah, so one of the other reasons that I've steered clear of chocolate pancakes is because the normal/buttermilk ones sound so much more superior all the time. These are good though--not your typically super-fluffy pancake. More like a cakey brownie... they probably even work better if you *don't* think of them as pancakes. lol. if you do try them, I strongly recommend having the chocolate sauce alongside, because these pancakes are super good at soaking up the sauce! Mango pudding made with creamed cottage cheese and apricot jelly sounds so good--care to share the recipe? I'd love to try it, especially since mango season's just starting up here! They look so decadent! 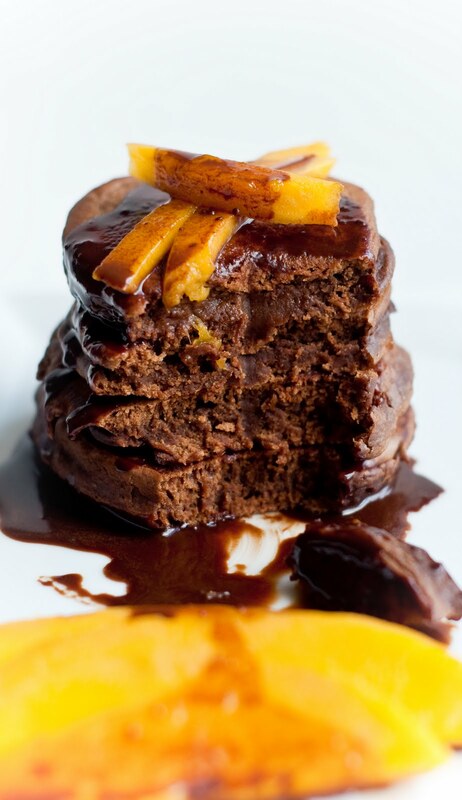 Love the idea of chocolate with mango. My pancake escapades have had to wait because I've come down sick and am supposed to avoid sweets.. over easter! What bad timing. 1.throw mangoes into the blender up to about 600 ml, and one tub (250g) of low fat cottage cheese (although you might want to check to make sure its not one of the uber salty ones.. I used one with about 330 mg of sodium per 100g) and blitz it. If you want to put it into jelly mould you might need to increase the gelatine a bit, or if you like it sweeter then use more jelly powder. I'm lazy so I just pour my pudding into a cocktail glass hehe. If you try it I hope you like it ^^ .. its practically a guilt free dessert right? I've never thought of putting chocolate and mango together but chocolate does kind of go with every fruit. The color contrast is stunning - the photos are delicious on their own!